Ever wonder why the entire world seems to get angry all at the same time. The mood of the masses change in a cyclical manner. This is why revolutions are world-wide. It’s also why economic slumps are world-wide. You can see this phenomenon occur again and again all through history. The answer is controversial to many, but science backs it up. The Planets Made Me Do It! I would suggest we’re affected because our brains are electrical – they’re energy fields—there’s no question about that. We get affected by even the smallest of electrical fields. That brings us around again to circadian rhythms. They set our body clock—when we get and up go to bed. You might think it’s all dependent upon when the sun comes up. Not necessarily. Rutger Wever, a German scientist did experiments over a 25 year period in a couple of underground bunkers. He kept Bunker 1 free from outside light, changes in temperature, sound, etc. but not electromagnetic fields. The second bunker was the same except that he blocked out electromagnetic fields. 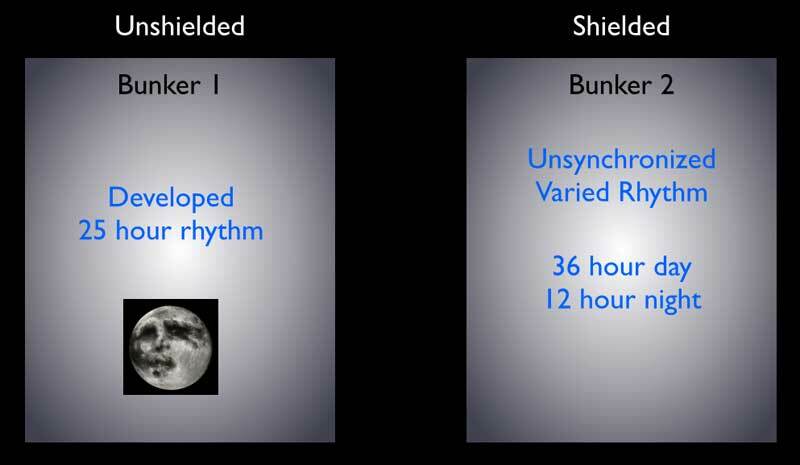 In the first bunker, the subjects became a bit unsychronized, but gradually developed their own rhythm close to twenty five hours.- that’s about one lunar orbit. However, the people in the completely shielded room became completely desynchronized. They developed rhythms of varying lengths – usually about a 36 hour day and a twelve hour night. He then introduced a tiny electric field to the room (0.025 volts per centimeter) at a rate of 10 hertz and most of the subjects became synchronized again – to that 25 hour day … the same amount of time it takes one full cycles of tides. 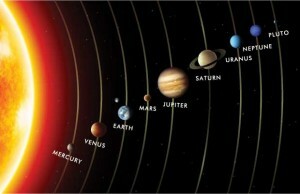 There are eight planets in our solar system. They all throw out electromagnetic waves that affect life on Earth. Contrary to what you might hear about “global warming,” we know the planets affect the travel of the Sun and this changes climate on Earth. But all the planets are never in exactly the same place twice (as they all travel at different speeds and our entire solar system is travelling through the Universe) … and that’s maybe why history rhymes. We know the planets give off electromagnetic waves that reach Earth. We know electromagnetic waves affect us through the pineal gland. We just don’t exactly know what they do and how they do it. Next time there’s a full moon or you think about what’s going on in the world, think about how we seem to be acting in similar ways at the same time around the world. Think about the riots in so many countries. Think about the wars. Think about what’s going on around us. Seems like a cycle to me. If you look back through history, you’ll also find a long list of events that changed history. I can’t help but think of all the atrocities we’re witnessing in the world today as they relate to the little I know of electromagnetic waves and how they affect the pineal gland in humans. 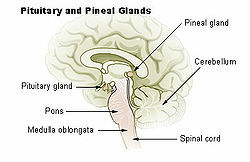 The pineal gland is responsible for regulating the release of melatonin. Melatonin has strong links to depression, hallucinations, sleep, and other human and animal brain functions. Here’s a brief explanation of where it is and what it does. Melatonin is what sets are circadian rhythms to what’s actually a 25 hour day (the default, apparently). That’s one revolution of the Moon around the Earth. Here’s a research paper on the effect of geomagnetism on the pineal gland. It’s a fascinating read if you’re so inclined. Studies are showing that people who are at all psychotic or suffering from mental disorders are more apt to be affected by external stimulation by low level electromagnetic waves. It seems to me that with all the reports in the media of extreme events being triggered by otherwise docile individuals that here’s an area that could use a bit more study. Science gives us reason to believe that we are affected more than we know by low level fluctuations in geomagnetic waves. 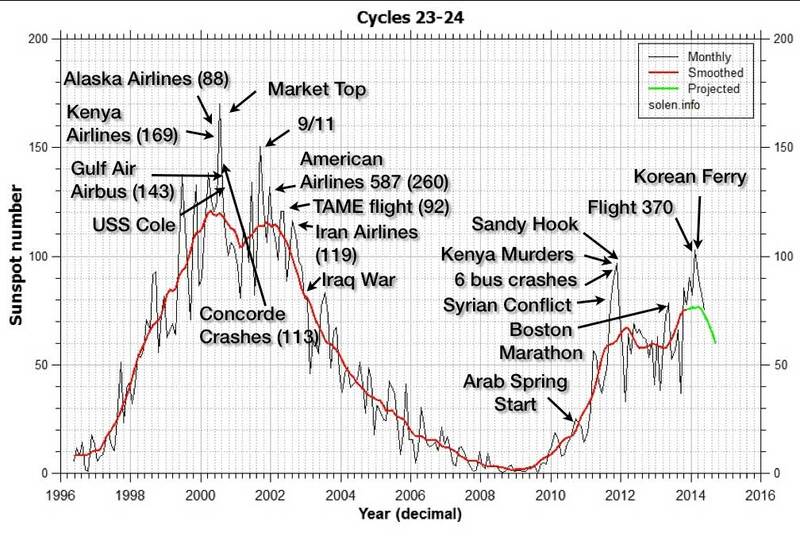 We know that the social mood changes worldwide in cycles. What other explanation could there be than a force that can affect human mood en masse? We know that animals are affected, and man is an animal. This is some of the background thinking behind this video, which due to the restricted timeframe imposed by video, doesn’t go deeply enough into the subject. I included the Moon and its affect on the Earth (through gravity in this case) to set up the idea that cycles are all around us. We take them for granted. 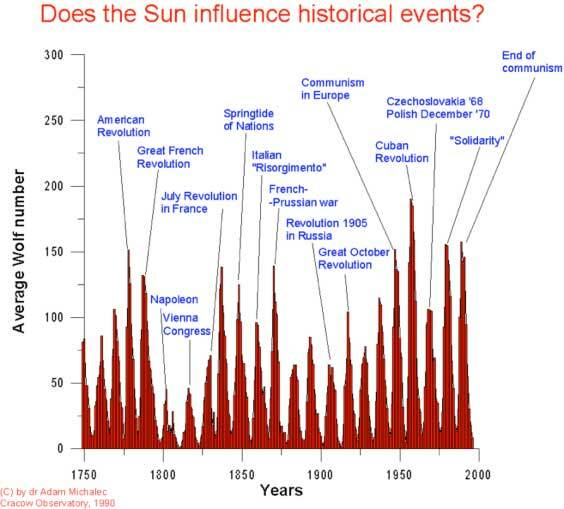 We have seasons, day and night, sun spot cycles every 11.2 years, and on and on. So, let’s start with the Moon. It has a huge effect on us. As a sailor, I can tell you we don’t go anywhere on the ocean without checking the tides. 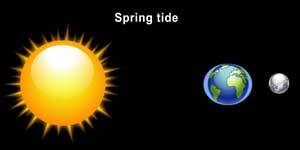 Tides are created by the gravity of the Moon pulling the water towards it. But the Moon also exudes a small electromagnetic field and there’s a good reason to believe that this is a trigger to our default 25 hour circadian rhythm. 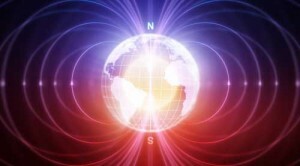 The Earth also has a very low electromagnetic, or geomagnetic field. It’s interesting to note that strong magnetic fields have no effect on the pineal gland, but there’s a small window at the level of the Earth’s inherent electromagnetic field that affects our pineal gland. This is the same wave intensity that Rutger Wever used to affect circadian rhythms. In any case, every large body in the heavens gives off electromagnetic waves. That includes the moon. Ever heard of the crazies coming out with the full moon? It’s real. You just have to ask a nurse or a cop. Or ask this guy. At the University of Miami, psychologist Arnold Lieber did a study over 15 years with almost 2000 murders. As the new or full moon approached, the murder rate rose sharply … for the entire fifteen years. Arnold Lieber’s book has run into some controversy. Others have not been able to repeat similar studies with like results on a consistent basis. But I think the issue is in what they’re looking for. Any cop, doctor, or nurse will swear by the effects of a full moon. However, there aren’t necessarily statistics to back that up because we don’t record every crazy action by a human being. I’m not suggesting the moon has an affect of that magnitude, but it seems to me that it has an effect. We know, for example of the 18.6 lunar nodal effect on regional sea level rise, and other cycles on Earth. In fact, this is exactly the same length as the 18.5 (I rounded it off) real estate cycle on a recent video I produced. This is one of the most prominent cycles discovered by Edward Dewey in the 1930s. And there are other cycles to move to the same drumbeat.